Wow!! That tiny little word doesn't begin to cover the awesome work aka eye candy that Sharon B of In A Minute Ago fame has posted on her blog! Myyyyyyyyyy goodness! I could just spend HOURS drooling over the awesome work that she has exhibited. The stitch combinations, the color variations, the truly unique style of needlework! She is FABULOUS! I don't know what else to say! I am in the throes of some life altering metamomorphosis... I don't know what is going on......noooo, it's NOT a mid-life crisis or anything.... I think i'm very slowly coming into my own and finally feeling like its OK to be me and (within reason ;-) ) say what I feel and think! I am learning to create what I like and what best expresses who and what I am. That's probably it....I have health issues right now and family concerns and am simply finding that my coping mechanism is in my creativity and needlework! Enough rambling......off to stitch!! Thanks Sharon for sharing your talent! 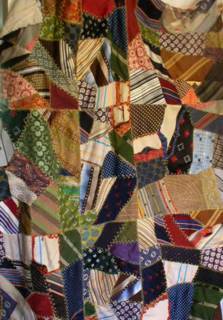 I have quietly assigned myself a mission to create a contemporary crazy quilt wall hanging. There are multiple reasons, the primary one being the challenge of actually combining items that are not normally found with each other and having them "work well" in the end product. I found one quilt, by Susan Lea Hackett that creates a landscape in a forceful way with fabric. http://www.qnm.com/articles/feature27/index1.html. While it is abstract it does not quite give me the jolt of challenge that I am seeking for this project. I am seeing squares and circles created with all manner of silks, satins, velvets, etc. pieced and tied together with lots of beadwork, sre and embroidery. (I'll add a picture of a drawing when I complete the thought process.) Basically i'm trying to think outside of the vintage cq box and hope to mastermind something that will be cherished by its intended as well as be an example of a newer form of crazy quilting! Not unlike Betty Pillsbury! If anyone comes close to being a mentor for me, it would be Betty and her gorgeous projects! http://www.bettypillsbury.com/gallery.html I hope to be able to emulate her in some small way, if only in my dreams. As I mentioned before, a comrade in needles and I are starting up a group dedicated to cq and all forms of needlework. Our loggerhead seems to be in how we can attract ALL generations and still share in this wonderful artform! There are so many wonderful ideas waiting to be explored and energy to be shared with the younger generation if only their curiousity can be captured long enough to show them the possibilities! If more people are exposed to new ideas and thought processes, perhaps they will feel more comfortable in attempting their own projects in a new, bolder way! 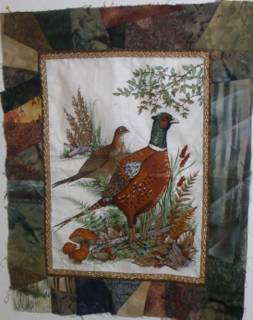 A needlework project I ran across here........ http://www.caron-net.com/galleryfiles/galloct.html.. holds some possibilities for combining some natural elements to the more architectural lines of fabric. There are lots of possibilities to explore! It should be a fun journey! Can't sleep from the back pain, so I decided to come out and explore while the world is a little more quiet. A site ( http://www.geocities.com/Heartland/Hills/6865/cqpage.htm) I came across with interesting information on cq, also had an area where there is discussion of creativity! It's funny....it seems women have been struggling with time management for years! In this article, http://www.womenfolk.com/creativity/moodling.htm, Anne Johnson speaks to our need to "moodle", meaning that we need to allow our minds to wander randomly so that we feel more creative! This applies to crazy quilting too...my passion! I find myself putting so much pressure on myself to create something "perfect" at times that I lose sight of the purpose of the project or the joy of the act of stitching. Anne has written other small articles on creativity that I think i'll explore and see if I can't return my focus to the joys of stitching! Journaling is another method of regaining focus...which reminds me of the Buddhist process called "mindfulness". By becoming more aware of our surroundings and appreciate the simple joys of life our spirits are renewed and we become more centered, refreshed and creative. I guess the point of all my rambling here is that I feel out of balance from living with this back pain and am finding myself drawn into the world of fibers and stitching to forget or overlook for a time how i'm feeling. It will be interesting to look back at this time and see how it is reflected in my work. Welll, after spending most of the afternoon getting it figured out, I have posted some pics of some projects that are in the works! The pheasant has some SRE and other embroidery work left to do...already have done some BE on it and then i'll get it applied to my husbands jacket back! He thinks it will be a great way to advertise our embroidery business! 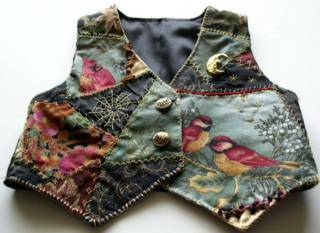 Then there's the little cq vest I did to compliment my grandsons specially made by grandma velvet suit for christmas. I loved the colors and the way they combined so nicely. The throw was originally done for my son by his great grandmother and has felt the passage of time, so it has fallen to me to help repair the damage and make it whole. It is truly a treasure of love! Lastly, is the cq landscape that is exemplary of a sunset in my part of Northern Colorado. TONS of work yet to be done, but it is fun to work on! The stream and rocks are three dimensional (I don't think that's very visible in the pic) through fabric manipulation. I will be adding loads of beads and buttons to represent the wildlife of the area and the sparkle of the crystal clear water in our mountains! This is a wonderful, expressive form of art for me. I really enjoy working with fabric and thread! Which I guess is obvious as I operate an embroidery business.... anyway, color, thread and fiber is wonderful to play and experiment with! I can't imagine doing anything else! Yeahhhhh!!!!! I'm getting there....slowly but surely!! Got some pics to post....so bear with my while I explore all the other technological marvels here! the mountain landscape is in progress and i'm just playing with a variety of ideas....it will be interesting to see what I end up with. Welllll, i'm trying to find my way through this technological hoopla! My "comrade in needles" and IT mentor, Mary Frances Main must shudder when she sees me coming! LOL!!! Someday i'll get all of this figured out and stop being intimadated by it! We're starting a regional crazy quilting group! www.rockymountaincrazyquilters.com. Can't wait to see how that turns out! I would really LOVE to see this take off here! 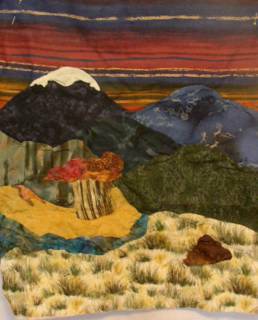 We have a yahoo group the Colorado Crazy Quilters that chat most every day and meet once a month. Its a cozy little group of ladies that have ALL kinds of interests.....not solely dedicated to cq though. As to crazy quilting....I like to explore lots of stuff. I absolutely adore doing landscapes and am also working on rejuveninating a couple of older crazy quilts that i've got.....one being an ALL silk ebay find and the other being a silk tie throw that a relative had created. I'm in the process of reallly trying to complete some projects right now so noone gets saddled with half done projects! 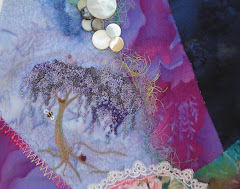 Wellll, enough of this....i'm off to fine tune this blog and get some stitching done! This is a whole new medium for me! I'm testing the waters and will see how well I do! I don't truly consider myself to be technologically inclined and let things daunt me probably more than I should! I definitely prefer to just stitch! :_) BUT...i'm hoping that this will allow me to explore my creativity in a new way and hopefully get in touch with part of my psyche that are hiding! A friend of mine and I are starting up a new crazy quilting "guild" or organization or whatever name it has to be called. I'm looking forward to meeting other folks that are interested in the same medium and are hopefully willing to think outside of the box and explore textile arts and their contributions and impact on crazy quilting! I think it will be fun!! More later!